Homemade coronation chicken and a crusty French stick. AKA the food of the gods. Somehow this simple dish is like food heaven for me. Leftover sausages. Preferably Bombay Bangers from the butchers in my parents village. Exceptionally tasty, even Lau (recent sausage convert) would agree. Quiche or some form of eggy pastry. Goats cheese and egg puff pastry parcels are equally as scrumptious as a Quiche Lorraine. Mint jelly sandwiches. Accompanied by some form of meat obviously, chicken, lamb or beef I’m not fussy. The mint is the key item in here. Pesto and mozzarella rice. Literally those three ingredients, although Mary Berry’s pesto dressing is preferable to a jar of pesto. Scrumptious. Cake. No preference on which. Just some form of cakes loveliness please. 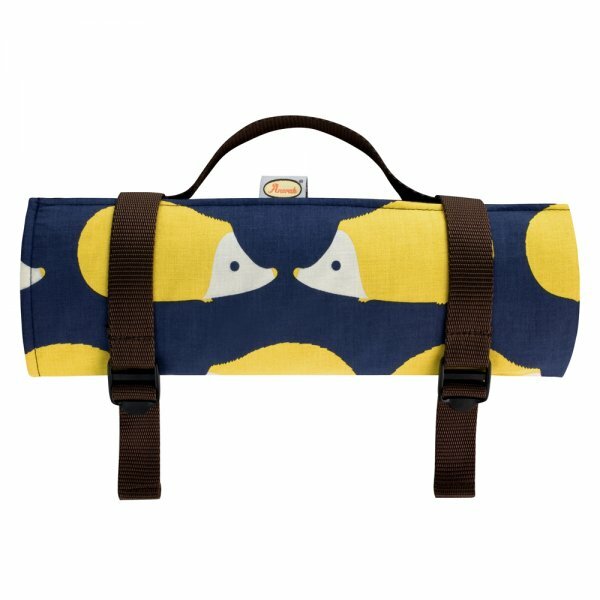 And finally this amazing picnic rug to laze on – who knew they did a hedgehog print! Oh how I love Anorak’s products. We’ve been in our rhubarb and custard kitchen for over three years now and it’s not really changed at all since we moved in. The fundamental bits and bobs are all the same, the only real difference is that we’ve got a new toaster – a shiny red one, not one of those cheap white plastic ones – and a few more homey items. Like our (my) Russian doll measuring cups and our super colourful Knickerbocker Glory glasses. Even though we don’t NEED anymore bits and bobbins in our kitchen – we have everything you could possibly need plus a few things you don’t (chalk and a lemon squeezer to name two things) – I still find myself browsing for things online. There are so many lovely bits and pieces around that I just know would make our kitchen an even lovelier place but I just can’t be flexing the credit card at the moment. So instead I’m adding them here, that way when I have a smidge more money I have a handy shopping list all in one place – genius you say! I’m going to start this post by explaining that my nickname when I was younger was ‘the strawberry queen’ because I could never get enough of strawberries – I still can’t in fact. I used to spend summer’s sitting in our garden’s strawberry patch devouring the fruits and I’m quite certain that no one else ever got a look in! So when I had to come up with a dish for our Guilty Pleasures evening I knew straight away that strawberries would have to be involved, but one problem: strawberries don’t make me feel guilty. Cream on the otherhand is another matter and suddenly I had the two main ingredients for my dish. 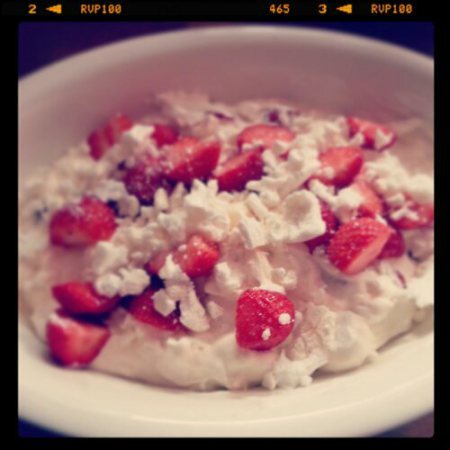 And let’s be honest once you have cream and strawberries then Eton Mess is the only logical option. This recipe couldn’t be easier as I used shop bought meringues – I did think about making my own but timing was a factor and I was feeling lazy. So instead it was shop bought all the way. as for the method, here’s what I did with my three ingredients; meringues, whipping cream and strawberries. halve the strawberries and crush the meringues – I used 2 punnets of strawberries (800g) and 4 meringues. next use an electric whisk to whip the cream into peaks, be careful not to over whisk and split the cream. Once whisked fold the strawberries and meringue into the cream. Voila you have yourself one super summery pudding. P.S. – Meringue is definitely something that I’m going to try making sometime soon, my dream is to be able to make those giant meringues with the swirls of chocolate and strawberry syrup running through it. P. P.S – on a side note my nicknames now range from Lozzle, Lauraloo and Lozzleberry. I think I prefer the strawberry queen! I’m a big fan of lemon cake and it’s one of my main choices when I’m having cake out (FYI the lemon polenta cake at Carluccio’s is absolutely delicious and beautifully zesty), but considering my love for this type of cake I really don’t make it enough! This needs to be rectified asap and so we’re starting with this scrumptious recipe, which is from Lorraine Pascale’s Fast, Fresh and Easy Food cookbook. I made this cake a few weeks ago when we had a night with our lovely friends. The premise of the night was ‘Guilty Pleasures’ so we watched classic films like Jerry Maguire and Step Up and ate cheese, bread, pastry items, Eton Mess, Dutch Apple Cake, etc. My contribution to this amazing spread was Lorraine Pascal’s Lemon and Lime Poppy Seed Cake, which everyone needs to make in their life. It really is scrumptious, soft, zesty and refreshing. You can’t not love it I promise. Enjoy – you’ll literally die over the moistness of this cake! A couple of weeks ago I was having a bit of an obsession with soup. I think it was because the weather was miserable, but all I fancied eating was something warm, filling and different. That’s the best thing about soup there are so many different flavour options. Anyway with my soup I wanted bread, bread to smother in butter and dunk into my leek and potato or country veg. I therefore decided to make some rolls that could go in the freezer, that way I could take a couple out in the morning and enjoy them warmed up in the evening with my soup. Now we all know that I like to make loaves of bread, but i’ve actually never made rolls. How is that possible you ask? Well put simply, I like what I know, so I do what I know. End of story. Anyways I scouted around for a roll recipe and found a Morning Rolls recipe in one of my favourite DK books. I decided to keep the rolls quite small so that I could have a couple at a time, rather than one big one. The size was similar to a snooker ball and made 18 if that helps you work out what you want to do sizewise. Place all the ingredients in a bowl. Add 275ml of tepid water to form a soft dough. Knead for 10 minutes, then place in a lightly oiled bowl and leave in a warm place to double in size – about 1 hour. Turnout onto a floured surface and knead briefly. Divide and shape into equal shaped balls. 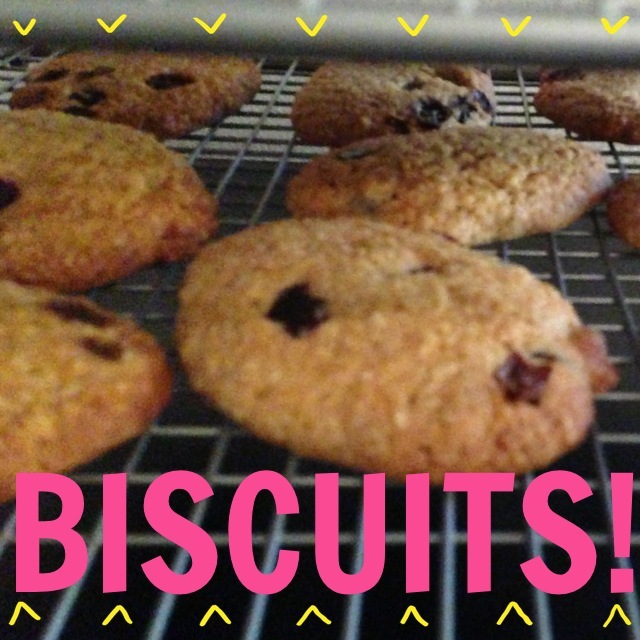 Place these onto oiled baking trays and leave to rise for 30 minutes. Place in a preheated oven (200C) for 20 minutes. They should be brown on top and sound hollow when tapped. Once they were cooled I put most of them in the freezer for another day. When you do want them just defrost before warming in the oven.